The Police has denied allegations that it is planning to break into the home of the Senator representing Kogi South Senatorial district, Dino Melaye. Melaye had alleged in a tweet on Wednesday that the force brought tools to break into and vandalize the house. He wrote, “Police bringing in toolboxes to break doors and vandalize my house. Police EOD truck just brought them. Media take note”. The Police, however, denied the allegations on Wednesday, while also taking journalists around the house as proof. It also deployed additional officers to secure the arrest of the senator while cordoning off his home on Sangha Street in Maitama, Abuja. The siege on his home has entered its sixth day. 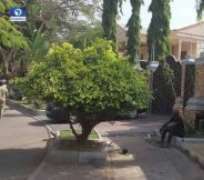 A team of policemen had stormed the senator's residence on Friday to arrest him. He, however, said in a phone interview that he was not at home and will report to the police this week.